Cerebrospinal fluid flow has been thought to mainly follow cardiac-related oscillations as suggested by electrocardiogram (ECG)-synchronized cine flow magnetic resonance imaging (MRI) [1, 2]. In contrast, flow MRI techniques without experimental prejudice due to cardiac gating revealed the significant influence of respiration [3–7]. 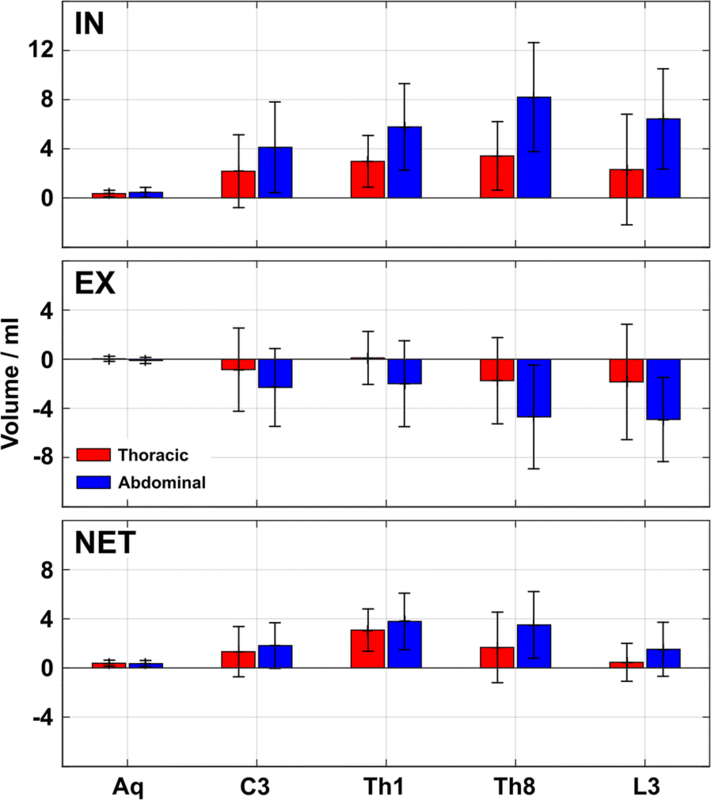 In particular, forced inspiration has been identified as the dominant regulator of CSF dynamics in all its compartments using flow-sensitive real-time MRI, while flow adjustments in relation to the heart beat represent a continuous albeit minor component [8, 9]. Forced inhalation prompted an upward surge of CSF from the thecal sac in the lumbar region along the entire spinal canal, into the cranial vault and passing through the aqueduct further upwards . Real-time phase-contrast flow MRI was performed at 3 T (Magnetom Prisma Fit; Siemens Healthcare). The technique is based on flow-encoded radial FLASH acquisitions with pronounced data undersampling and image reconstruction by nonlinear inversion and offers access to high spatial and temporal resolution [17–20]. For this study, the sequence exploited ideas by Bernstein et al. for minimizing the gradient-echo time (TE) of flow-encoded acquisitions. The scan parameters were as follows: repetition time (TR) 5.68 ms, TE 4.61 ms, slice thickness 5 mm, flip angle 10°. The field of view was 192 mm or 256 mm depending on the position along the spine, while the in-plane resolution was fixed to 0.75 × 0.75 mm2. 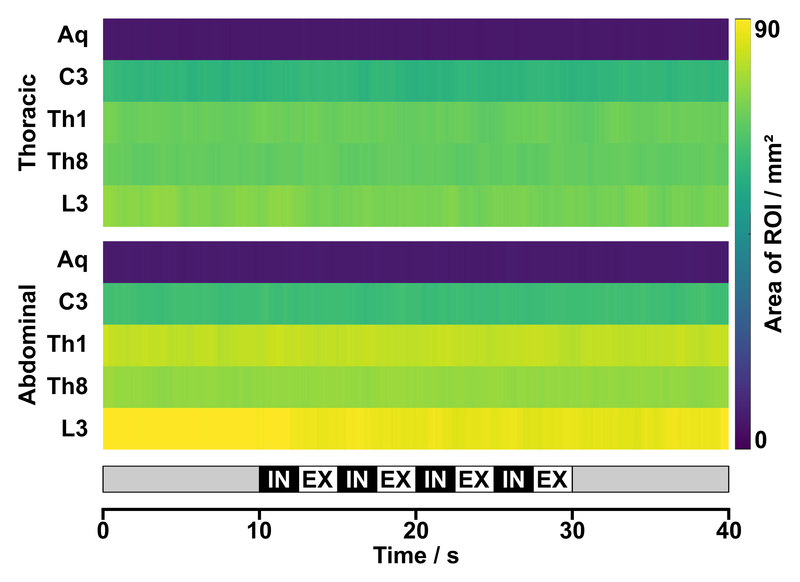 Two flow-encoded acquisitions were each acquired with 11 radial spokes yielding a temporal resolution of 125 ms per phase-contrast velocity map. The velocity sensitivity varied between 10 and 40 cm s−1 depending on the expected flow velocities and the breathing performance of the subjects. Lumbar (L3) and thoracic regions (Th8 and Th1) of the spinal canal were measured using suitable elements of the 18-channel thorax coil and 32-channel spine coil, while acquisitions at the cervical spinal canal (C3) and aqueduct were conducted with use of the 64-channel head coil. 12987_2019_130_MOESM1_ESM.png Additional file 1: Figure S1. Regions-of-interest along spinal CSF space and aqueduct. Sagittal T2-weighted image of the whole spine indicating selected cross-sections for ROI placements. Aq = aqueduct; C3 = cervical level 3; Th1/Th8 = thoracic levels 1/8; L3 = lumbar level 3. 12987_2019_130_MOESM2_ESM.png Additional file 2: Figure S2. Adherence to the breathing protocol. Upper part: CSF flow (ml s−1) (black line) closely follows movements of the abdominal wall (a.u.) (blue dotted line) (subject #18). Note the distinct amplitude increase reflecting extensive movements of abdominal wall during forced respiration. The timing of the respiratory cycles was incorrect. 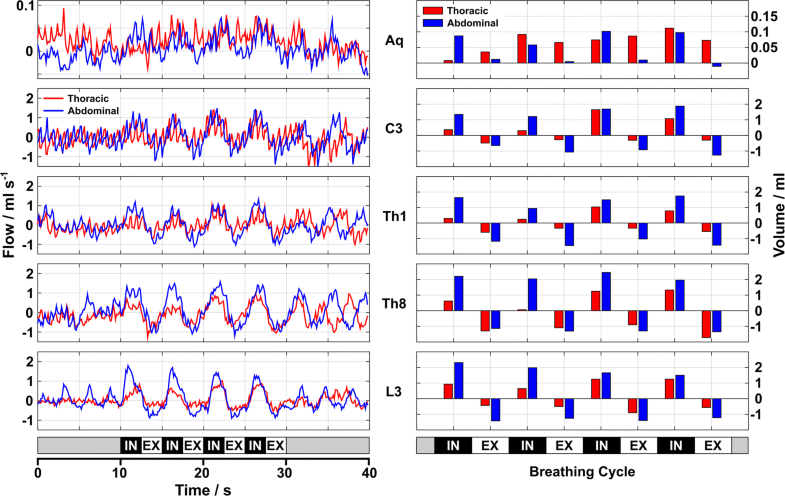 CSF motion correlates with breathing but not with time intervals of the protocol (at the bottom). Correlation function (orange line) was applied to correct for the shift in time. Lower part: after correcting for the error in timing. Signal of abdominal wall and corresponding CSF flow matches the timing of the protocol. IN = inspiration; EX = expiration; S.I. = signal intensity; a.u. = arbitrary units. 12987_2019_130_MOESM3_ESM.avi Additional file 3: Video S1. Real-time MRI of forced thoracic respiration at 30 fps. Sagittal plane through right diaphragmatic dome. The thoracic cavity enlarges during inspiration because of elevation of frontal thorax wall and lowering of the diaphragm. The space between the diaphragm and the rear thoracic wall (costodiaphragmatic recess) increases. 12987_2019_130_MOESM4_ESM.avi Additional file 4: Video S2. 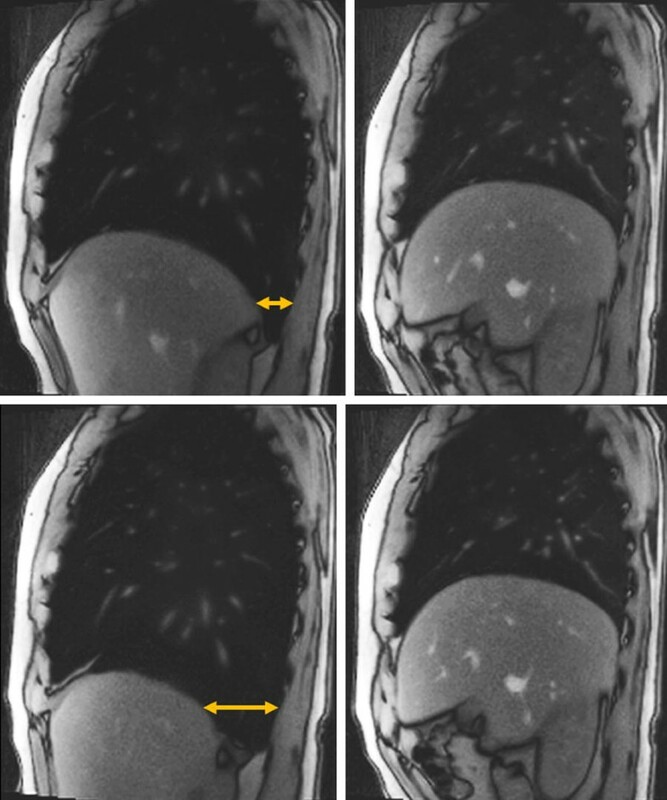 Real-time MRI of forced abdominal respiration at 30 fps. Sagittal plane through right diaphragmatic dome. Downward movement of the diaphragm is more pronounced during forced inspiration. 12987_2019_130_MOESM5_ESM.docx Additional file 5: Table S1. Mean CSF volumes during 4 cycles (20 s) of forced in- and expiration (ml). Mean CSF flow volumes averaged across 4 cycles of forced inspiration and expiration, respectively, for all 18 subjects. Aq = aqueduct; C3 = cervical level 3; Th1/Th8 = thoracic levels 1/8; L3 = lumbar level 3; Abd = abdomen; In = inspiration; Ex = expiration. 12987_2019_130_MOESM6_ESM.png Additional file 6: Figure S3. Time courses of ROI areas (mm2) for CSF analysis. 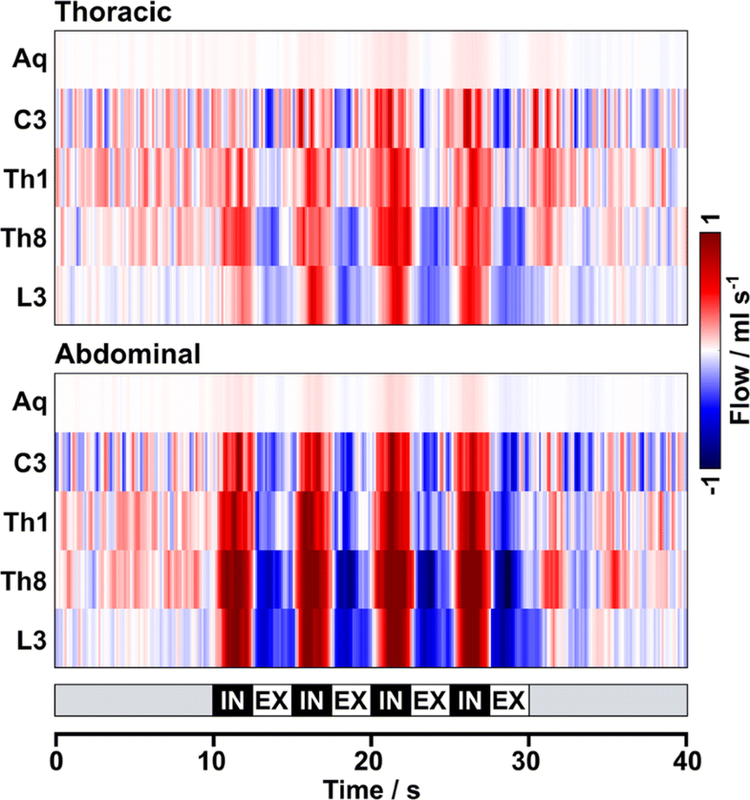 Color-coded mean areas averaged across subjects show no significant change over time during forced thoracic (upper part) and abdominal (lower part) breathing. Aq = aqueduct; C3 = cervical level 3; Th1/Th8 = thoracic levels 1/8; L3 = lumbar level 3; In = inspiration; Ex = expiration. 12987_2019_130_MOESM7_ESM.docx Additional file 7: Table S2. 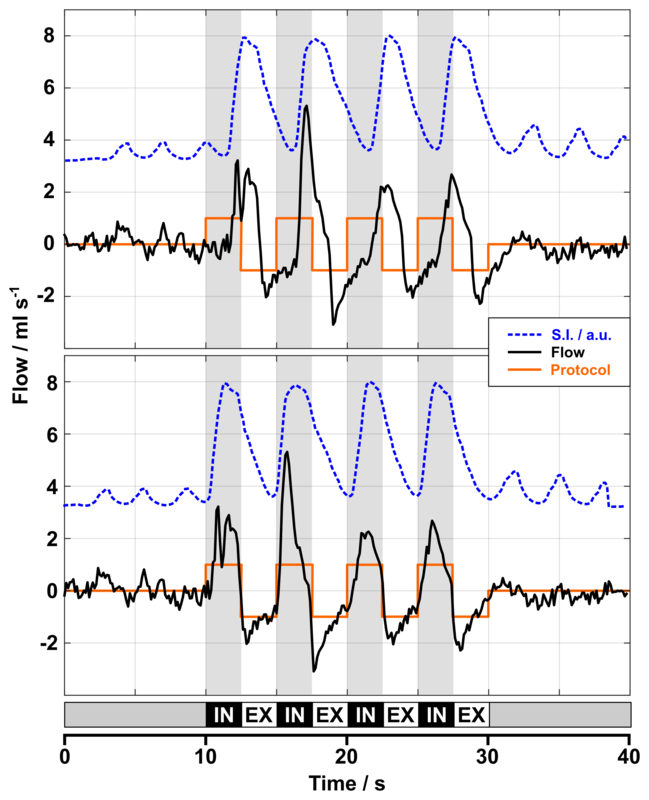 Minimal and maximal CSF flow velocities (cm s−1) during 20 s of forced in- and expiration. Minimum and maximum velocities of all 18 subjects at all levels obtained during 20 s of forced thoracic and abdominal breathing, respectively. Pos = position; Aq = aqueduct; C3 = cervical level 3; Th1/Th8 = thoracic levels 1/8; L3 = lumbar level 3.